Nikandish, N., Eshghi, K., Torabi, S. (2009). Integrated Procurement, Production and Delivery Scheduling in a Generalized three Stage Supply Chain. Journal of Industrial and Systems Engineering, 3(3), 189-212. Naser Nikandish; Kourosh Eshghi; S. Ali Torabi. "Integrated Procurement, Production and Delivery Scheduling in a Generalized three Stage Supply Chain". 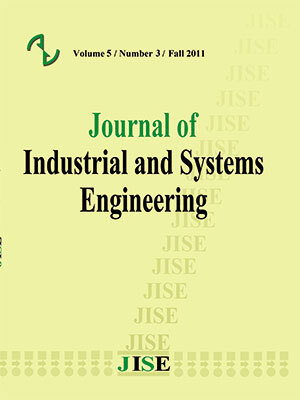 Journal of Industrial and Systems Engineering, 3, 3, 2009, 189-212. Nikandish, N., Eshghi, K., Torabi, S. (2009). 'Integrated Procurement, Production and Delivery Scheduling in a Generalized three Stage Supply Chain', Journal of Industrial and Systems Engineering, 3(3), pp. 189-212. Nikandish, N., Eshghi, K., Torabi, S. Integrated Procurement, Production and Delivery Scheduling in a Generalized three Stage Supply Chain. Journal of Industrial and Systems Engineering, 2009; 3(3): 189-212. In this research, we investigate a three-stage supply chain with one supplier, several manufacturers and multiple retailers where the supplier provides a common raw material to each manufacturer, who in turn uses a single stage production facility to convert it into final products that are delivered at fixed lot sizes to retailers. An integrated economic procurement, production, and delivery model is developed whose objective is to find the common production cycle length, production sequences of final products at manufacturers and delivery frequencies of final products to retailers minimizing the total costs of considered supply chain. We propose an analytical solution procedure and an efficient heuristic solution method. The proposed heuristic solution algorithm is able to find the optimal solutions for the small and medium problem instances and consequently it is very promising for solving the large-sized instances in a reasonable time. extensions; European Journal of Operational Research; In press. problem in a common cycle case; European Journal of Operational Research 175; 1141-1150.
International Journal of Production Research 15; 107–111. International Journal of Production Economics 28; 235-252.
schedule; IIE Transactions 27; 126-139.
policies; Transportation Science 29(3); 222-241. Transportation Research Part E 39; 193–208. finished goods delivering; Omega 33; 163-174.